What was once a small BBQ joint is now a restaurant mecca and a League City landmark, and what was one will soon be three. Red River BBQ & Grill was started in 2002 in the old Weaver’s BBQ building. The dynamic brothers Kevin and Ric Kiersh had a passion for cooking and did not have any previous restaurant experience other than brother Ric had a barbecue catering company in College Station after graduating college at Texas A & M.
The two brothers parlayed their love of cooking good food, family recipes and business acumen and started Red River BBQ & Grill. They both enjoy working hard and serving only food that they are proud of and would eat themselves. 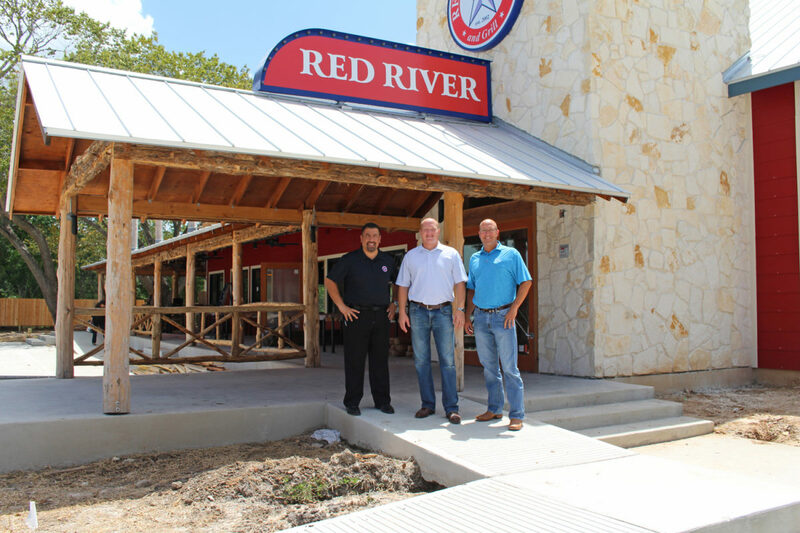 Soon they will be starting a new chapter – Red River Cantina in League City. They believe that hiring talented people is one of the keys to success such as the new Red River Cantina General Manager Jim Molina, who boasts over 20 years restaurant experience with Pappasito’s. “ We knew Jim was extremely talented and could help us get our restaurants to the next level,” stated Kevin Kiersh. Another important ingredient of serving delicious mouthwatering barbecue is that they cook it the old fashion way. They use pits that are 100% wood fired – unlike many BBQ restaurants today that use natural gas or electric heated rotisseries. Red River BBQ cooks their meats throughout the day to maintain the freshness and the demand. The trio believes in using the highest quality meats available. In order to have great tasting sides, they make everything from scratch. “We are known as a scratch kitchen,” stated Kevin Kiersh. In 2011 they started their second successful location in Katy which Pitmaster Ric Kiersh runs and operates. Red River BBQ & Grill is truly a family business and not a chain. Red River is rather unique. They serve barbecue to their customers in a friendly restaurant style with personal attention and service. Unlike most of the other BBQ chains that serve their food cafeteria style. Kevin Kiersh and his beautiful wife, Danna, have three children, and brother Ric Kiersh and his lovely wife, Julie, have two children. All are excited about launching their newest concept – Red River Cantina – which will go into the present Red River BBQ location. The Red River BBQ Landmark will go into their new beautifully designed and constructed Authentic Texas Country building. It is located directly behind the present location. The new restaurant is scheduled to open in mid-September of this year where upon the Red River Cantina construction and remodeling will begin at that time. Its planned opening is the spring/summer of 2018. Love the Kiersh family and their restaurants! Best fried shrimp and potato salad, similar to their grandmother’s. Looking forward to seeing the new digs for the BBQ and then, the Cantina!